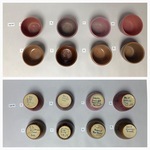 "Glaze Test Bowls, Lot 18 - Reds, pinks, browns"
Lot of 8 ceramic glaze test bowls. Pinks, reds, browns. "Glaze Test Bowls, Lot 18 - Reds, pinks, browns" (2018). UND Pottery Collection. 2252.